Dear readers , it’s time to take our destiny, time to think about and make plans for our big nation . The area of the Congo was one of the principal sources of slaves to markets in Arabia, the Middle East, and the New World. The trade had devastating effects on both Kongo and non-Kongo communities for almost 400 years. By the late seventeenth century, up to 15,000 slaves a year were sent out of the lower Congo River area. The European slave traders were usually the final link in a chain of African and Arab merchants who brought slaves down to coastal trading posts. The slave trade in the eastern part of present-day Zaire was dominated by Arabs and continued until the late nineteenth century. All European nations had abolished the trade by the mid-nineteenth century, and the end of the American Civil War in 1865 extinguished another main market. Besides the obvious depopulation, the slave trade in the Congo area had caused many local rebellions and increased ethnic warfare. On the eve of the Belgian conquest in the late nineteenth century, Congolese societies had reached a degree of internal dislocation that greatly lessened their capacity to resist a fullscale invasion. Resistance to outside forces was further hampered by the devastating raids and civil wars that followed in the wake of the slave trade, by the subsequent improvement in the capacity of Africans to destroy each other through the use of firearms, and ultimately by the divisions between “collaborators” and “resisters” and between the allies of the Arabs and the allies of the Europeans. In addition, a more enduring cleavage had emerged out of the varying exposure of Zairian societies to Western influences and early trade activities. Long before the conquest of the vast hinterland, the coastal communities had had centuries of contact with Europeans; by the time the Conference of Berlin began in 1884, on the other hand, most of the societies of the interior had yet to experience the full impact of European rule. Out of these different historical experiences emerged different self-images and cultural dispositions. That the Kongo peoples were the first Zairian people to challenge the legitimacy of the colonial state is perhaps not unrelated to their long and dramatic experience of European hegemony. Thank you for this instructive article. 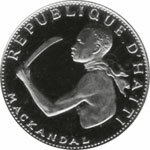 The name “Makandal” can also possibly stem from “Makandala”, which is not unknown or uncommon in the Kongo region. To my knowledge it has no special significance. Thank you again for letting us dream. Dear Sir: Interesting article, I just like to read history and an piece on Mr. Denmark Vesey caught my attention. Thanks again for opening the window on history.